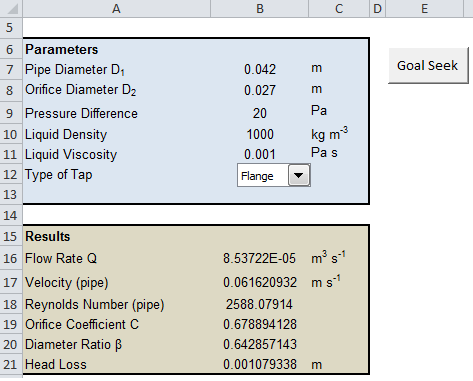 This Excel spreadsheet calculates the liquid flowrate from a small-bore orifice meter using the equations defined in ASME MFC-14M-2001. The calculation is iterative, but the spreadsheet is conveniently set up to use Excel's Goal Seek functionality by simply clicking a button. The equations implemented in the spreadsheet are sourced from ASME MFC-14M-2001 and are given below. The notation is given below. 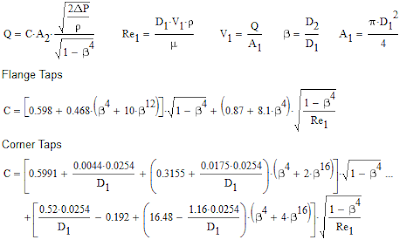 C is the discharge coefficient. 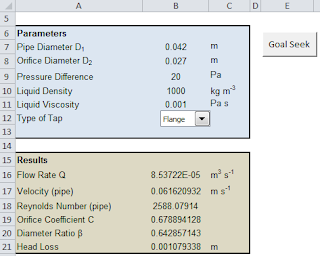 D1 must be supplied in m. The equation differs for flange taps and corner taps, but a menu in the spreadsheet allows you to pick between the two. The correlations for the Flange Taps and Corner Taps discharge coefficient are only valid for the following configurations. A β of between 0.3 and 0.7 is practical; below this, the pressure drop is too large for economical operation, and above this, the pressure drop is not large enough for an accurate reading. The Excel spreadsheet will also calculate the static pressure loss and the head loss from a distance D1 upstream and 6 D1 downstream of the orifice. The spreadsheet is free, and none of the cells are hidden, locked or password protected. Please visit this website regularly for more exclusive, professionally prepared Excel spreadsheets for engineering.